GPS Points N64° 52' 16.477" W23° 1' 11.711"
Folk artist with an open workshop and gallery. Open all year round daily from 09:00 to 21:00. 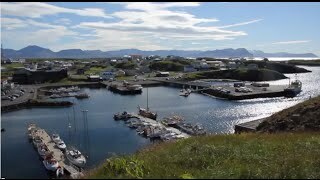 Láki Café is located downtown Grundarfjörður, serving light refreshments, such as quality coffee, cakes, soup of the day, lunch, pizza, panini and more. Open daily, all year round.